Tonight the new schedule of Serie A ’09-’10 was published by Lega Calcio. Genoa plays the first match in Luigi Ferraris on Sunday 23rd Augustus against A.S. Roma. The second match is 1 week later in Bergamo against Atalanta. The homederby takes place on Sunday 29th November, while the return is on 11th April 2010. The complete schedule including the playdates of the Europa League will be published on this site in a few days. After beating Stubaital by 17-0 (topscorers Crespo and Floccari who both scored 3 times) and Rodengo Saiano (2-1, goals of Crespo and Sculli) the European adventure of Genoa started last Friday in Brussels against Anderlecht. The Belgium team already trained for 5 weeks because they play this week their first pre-round match of the Champions League, while Genoa only was in training for 11 days. Genoa got the support of 200 fans, including some Dutch members of Genoa Club Amsterdam. Genoa started the match with the following team: Rubinho; Biava, Bocchetti, Moretti; Mesto, Kharja, Juric, Criscito; Sculli, Crespo and Jankovic. After 14 minutes Juhasz scored the opening goal, but only 12 minutes later our central midfieldplayer Houssine Kharja scored just outside the penaltyarea the equalizer: 1-1. Despite several chances both teams did not score anymore, so Genoa left Brussels with a draw. Next Wednesday Genoa plays against Acqui (Serie D) and Saturday Olympique Nice is our following opponent. Wednesday 5th August we play in Reggio Emilia against their hometeam Reggiana (Serie C-1) and 3 days later we play against Pro Vercelli the team that was 7 times Champion of Italy in the past and now plays in Serie C-2. The pre-season ends with the match at Thursday 13th August in Spain against Villareal, exactly 7 days before the first match in the Europa League and 10 days before the start of Serie A.
Matteo Ferrari (29 years) could not refuse the fantastic financial offer of € 2,5 million netto every year of Besiktas (Turkey), so he left Genoa after only 1 fantastic season. With the youngsters Salvatore Bocchetti (22) and Sokratis Papastathopoulos (21) we already have 2 good central defenders in the selection that can substitute “King of the air” Ferrari. Besides the youngsters also 32 years old Giuseppe Biava can play as a central defender, while probably tomorrow also another central defender (Andrea Esposito of Lecce) will be bought by Mr. Preziosi. Because Mr. Gasperini transformed Mimmo Crisicito into a left-midfield player we needed a new left defender. 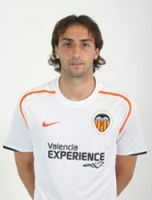 After 5 seasons with Valencia (Spain) now Emiliano Moretti (29) returns in his homecountry to play with Genoa. We also found our 6th striker after Sculli, Jankovic, Crespo, Floccari and Palladino in Argentinian Rodrigo Palacio (27) of Boca Juniors, who already played 8 times in his National team. Now Mr. Gasperini has, as he wanted, 6 players who can play as the 3 strikers in the favorite 3-4-3 system. Ferrari goes ? Panucci and Moretti arrive ?? Matteo Ferrari last year came home from A.S. Roma towards his former club of the beginning of his career: Genoa. This week Matteo received a financial offer you hardly can’t refuse of Besiktas in Turkey. Because he did not sign the contract there is still a little hope that Matteo Ferrari stays with us, but as a good President mr. Preziosi already is bussy to think about a new experienced central defender. Rumours in the media say that Genoa is close to buy 2 experienced Italian defenders: Christian Panucci of A.S. Roma who started his career with Genoa, just as Ferrari, and Emiliano Moretti of Valencia who played before he went to Spain with Fiorentina and Juventus.